Well, this is a pleasant surprise: Bandai’s “Super Model Spirit” Rockman Trading Figures are now being sold outside of Japan, through Toys "R" Us, no less. TRU's online store started selling the miniature figures, which, until now, have largely been exclusive to specialty importers. For $23.99 USD (eligible for free shipping! ), you'll receive a set of three, randomly chosen individually packaged, blind-boxed figures. As noted in the product description, the figures are online exclusive so you won't be finding them at your local TRU. Additionally, it remains to be seen just how long they'll have 'em in stock, so you might want to order ASAP. If this is something up your alley, you can order a set of your very own right here. They're randomly chosen and for "Trading". If you want something for a "good price", buy real figures. And to think I was worried about the value of the extra case I bought from Japan. If this is how they're selling these things stateside, then only the truly desperate Megaman fans will go for this farce. Random three figure sets? At that price? These things ain't Cracker Jack boxes. How many costly sets would you have to buy before actually getting a full set? How many extras would you wind up with? At least with the Japanese cases you were guaranteed a full set (plus an extra AirMan figure). They better offer a complete collector's set of these before long, because this just doesn't cut it. I don't think you know what these are. I gotta say... for miniature figures? These things are the bomb!!! Just gotta love that Zero (both of them), X, and Bass figures!!!! Fffuck.. 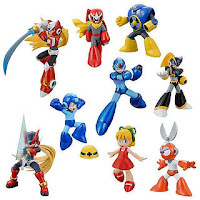 I'm guessing Zero and Protoman will end up being the rare ones, or most expensive on ebay. I don't think my dog knows what a Veterinarian is. Such a great information for me! I want to know that what is this a good price in Japan? Thanks for sharing with us this info. @Hypercoyote: It's a pretty good price. Ebay has some of them for 40 a pop and at Otakon I couldn't get one for less than 10. So 23.99 for 3 is a deal, IMHO. I went into Otakon determined to get an X and 40 dollars later I ended up with a Bass, Proto, Mega, and finally, an X. 40 dollars for the one I wanted..? Meh, not so bad! So much want... shame Canadian Toys R Us probably won't stock it. What is the E-Tank Keychain? Was that something that you got if you bought the case? Or is that another randomly inserted item? The free shipping is a crock, btw. You have to spend minimum of $100, and there's a cap of $20 for the free shipping, so you pay the difference. Cheapest you can do is buy quantity of 5 to get the total over $100 which results in $28.50 shipping, less $20 = $8.50 shipping, which isn't too bad. I'm assuming these are being shipped from Japan by the shipping price. @hypercoyote - the little e-tank comes with one of the figures in the box. The E-can cellphone chain comes with Roll. I got mine during Comic-con, they were 10 dollars each and I only got one of the two Megamans, Protoman, Zero, Protoman, Cutman and Bass. So 24 for 3 is 5 dollars less than what I would have gotten them for.